I caught the cold bug that's been going around so not much energy today. Decided to work on a card and postpone painting the dining room until I feel a bit better. 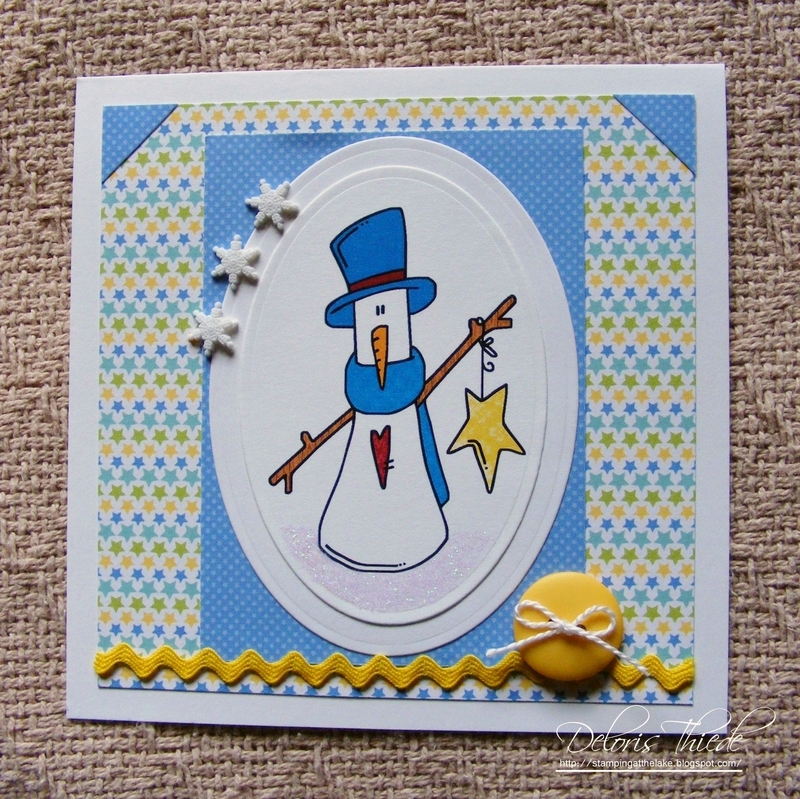 This sweet snowman is one of my favorites by Bugaboo stamps. Colored him with lots of patterns in PSE. Cut out with Nestabilities dies. Also used Studio G glitter glue for the snow, snowflake buttons, a yellow button, white twine, yellow ric rak and paper by Doodlebug Designs. He's a gem! I was just looking at a card in my stash that him on it, and thinking more people should use him.........and here he is!! :) Love it! Very sweet Deloris! I really like the ric rac and button....nice touch. SO cute ~ love the snowman. This is a lovely card Deloris, such a cute Bagaboo Image, love your colours and design papers. Your blue and white paper look like snow falling. 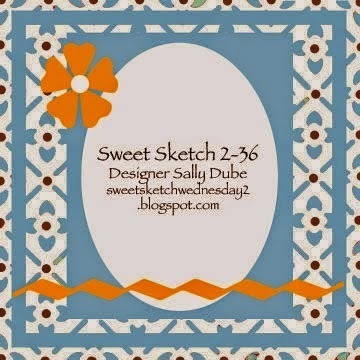 Great card and thanks so much for showcasing your talent with us over at Sweet Sketch Wednesday 2 and good luck. This snowman definitely is a sweetie!! Love your colors and papers. Thanks for joining us this week at Sweet Sketch Wednesday 2. Cute little snowmen are what got me stamping in the first place!!! Oh so fun! Wow, I absolutely adore snowman images and that one is ... completely adorable. Thanks so much for sharing this with us over at Sweet Sketch Wednesday 2. Such a cute card with the adorable snowman, and great for our Celebration Challenge this week at Eureka Stamps. Thanks for joining us. Great job with the sketch! I like the papers and fun colours you picked. Thank you so much for playing along with our Snowman Challenge at Crafty Catz. Good luck and hope to see you back soon! Such a sweet card! I love that snowman! Thanks for joining the Craftin Desert Divas "Christmas" Linky Party.